Bentley Motors Limited (/ˈbɛntli/) is a British company that designs, develops, and manufactures luxury motorcars which are largely hand-built. It is a subsidiary of Volkswagen AG. 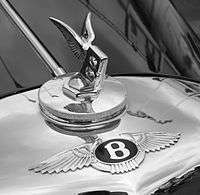 Now based in Crewe, England, Bentley Motors Limited was founded by W. O. Bentley on 18 January 1919 in Cricklewood, North London. Bentley cars are sold via franchised dealers worldwide, and as of November 2012, China was the largest market. 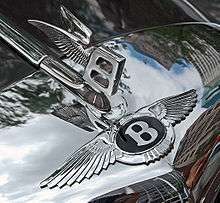 Most Bentley cars are assembled at the Crewe factory, but a small number of Continental Flying Spurs are assembled at the factory in Dresden, Germany. Bodies for the Continental are produced in Zwickau, Germany. Bentley won the 24 Hours of Le Mans in 1924, 1927, 1928, 1929, 1930, and 2003. Regarded as a British luxury automobile icon, Bentley models include the Bentley 4½ Litre, Bentley Speed Six, Bentley R Type Continental, Bentley Turbo R, and Bentley Arnage. As of 2015, Bentley produce the Continental Flying Spur, Continental GT, Bentley Bentayga and the Mulsanne. Rolls-Royce bought Bentley from the receivers in 1931 and subsequently sold it to Vickers plc in 1980 when Rolls-Royce themselves went bankrupt. In 1998, Vickers sold it to Volkswagen AG. The sale included the vehicle designs, model nameplates, production and administrative facilities, the Spirit of Ecstasy and Rolls-Royce grille shape trademarks, but not the rights to the Rolls-Royce name or logo which are owned by Rolls-Royce Holdings plc and licensed to BMW AG. The Bentley Boys were a group of British motoring enthusiasts that included Woolf Barnato, Sir Henry "Tim" Birkin, steeple chaser George Duller, aviator Glen Kidston, automotive journalist S.C.H. "Sammy" Davis, and Dr Dudley Benjafield. The Bentley Boys, favored Bentley cars. Many were independently wealthy and often had a military background. 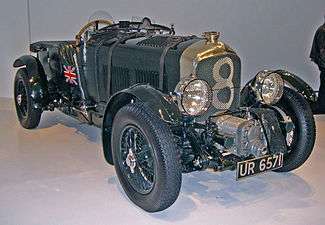 They kept the marque's reputation for high performance alive; Bentley was noted for its four consecutive victories at the 24 Hours of Le Mans from 1927 to 1930. In 1929, Tim Birkin developed the 4½ litre, lightweight Blower Bentley at Welwyn Garden City and produced five racing specials, starting with Bentley Blower No.1 which was optimised for the Brooklands racing circuit. Birkin overruled W.O. and put the model on the market before it was fully developed. As a result, it was unreliable. In preparation for war, Rolls Royce and the British Government searched for a location for a shadow factory to ensure production of aero-engines. Crewe, with its excellent road and rail links, as well as being located in the northwest away from the aerial bombing starting in mainland Europe, was a logical choice. Crewe also had extensive open farming land. Construction of the factory started on a 60-acre area on the potato fields of Merrill's Farm in July 1938, with the first Rolls Royce Merlin aero-engine rolling off the production line five months later. 25,000 Merlin engines  were produced and at its peak, in 1943 during World War II, the factory employed 10,000 people. With the war in Europe over and the general move towards the then new jet engines, Rolls Royce concentrated its aero engine operations at Derby and moved motor car operations to Crewe. Bentley Mark VI standard steel saloon, the first Bentley supplied by Rolls-Royce with a standard all-steel body. ↑ Volkswagen AG 2012, p. 68. ↑ Volkswagen AG 2012, p. 49. ↑ Volkswagen AG 2012, p. 102. 1 2 Volkswagen AG 2012a, p. 120. ↑ Volkswagen AG 2012a, p. 121. ↑ Armistead, Louise (9 October 2013). "Video: behind the scenes at the Bentley factory". The Daily Telegraph. London. ↑ Volkswagen AG 2012, p. 19. ↑ "Volkswagen Aktiengesellschaft Facts and Figures 2012" (PDF). volkswagenag.com. Volkswagen Aktiengesellschaft. 11 June 2012. 1058.809.453.20. Archived (PDF) from the original on 10 August 2012. Retrieved 10 August 2012. ↑ "Volkswagen Aktiengesellschaft Annual Report 2011" (PDF). volkswagenag.com. Volkswagen Aktiengesellschaft. 12 March 2012. 258.809.536.00. Archived (PDF) from the original on 8 August 2012. Retrieved 8 August 2012. ↑ Armitstead, Louise (6 October 2013). "Monday Interview: Bentley boss on what's driving demand for luxury British cars". London: The Telegraph. Retrieved 10 April 2014. ↑ Einhorn, Bruce (5 April 2012). "The Surge in China's Auto Sales May Soon Slow". Bloomberg Businessweek. ↑ "BENTLEY: MADE IN GERMANY". PistonHeads. 14 November 2013. Retrieved 11 April 2014. 1 2 3 4 5 6 Georgano, Nick, ed. 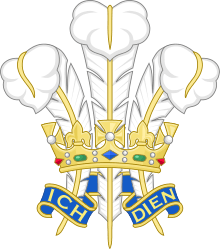 (1 October 2000). Beaulieu Encyclopedia of the Automobile (Hardcover, Reprint ed.). Oxford, United Kingdom: Routledge. ISBN 1-57958-293-1. ↑ "Bentley's racing heritage". The Telegraph. 5 October 2016. 1 2 Wagstaff, Ian (September 2010). "3: The Not-So-Roaring Twenties". The British at Indianapolis=. Dorchester, UK: Veloce Publishing. pp. .26–27. ISBN 978-1-84584-246-8. Retrieved 11 October 2013. It was an event that was to prove a costly exercise for the Cricklewood-based company in sending both a professional driver and a mechanic with the car. ↑ Davidson, Donald; Schaffer, Rick (2006). "Official Box Scores 1911–2006". Autocourse Official History of the Indianapolis 500. St. Paul, MN USA: MBI Publishing. p. 327. ISBN 1-905334-20-6. Retrieved 9 October 2013. ↑ Melissen, Wouter (12 January 2004). "Bentley Speed Six 'Blue Train Special'". UltimateCarPage. Retrieved 4 November 2008. ↑ Burgess-Wise, David (1 January 2006). "The Slippery Shape of Power". Auto Aficionado. Archived from the original on 24 March 2009. Retrieved 4 November 2008. ↑ "Bentley Motors To Give Up Racing". Evening Telegraph. Angus, Scotland: British Newspaper Archive. 1 July 1930. Retrieved 23 July 2014. (subscription required (help)). ↑ Feast, Richard (2004). "When Barnato bought Bentley". The DNA of Bentley. St. Paul, MN: MotorBooks International. pp. 64–65. ISBN 978-0-7603-1946-8. Retrieved 26 March 2012. ↑ Finley, Ross (29 November 1985). "Luxury of the long-distance cruiser". Glasgow Herald. p. 21. Retrieved 5 April 2013. ↑ Stein, Ralph (1952). Sports Cars of the World. Scribner. p. 43. Retrieved 29 September 2013. These, known as "the silent sports car," have been successfully marketed for almost twenty years now in various models. ↑ Sewell, Brian (13 July 2004). "New Bentley is a drive in the wrong direction". The Independent. London. Retrieved 5 April 2013. ↑ "Bentley Crewe History 1914 - 2006". Jack Barclay. Archived from the original on 5 March 2012. Retrieved 19 November 2010. ↑ Ollerhead, P. (2013). Crewe's Rolls-Royce Factory From Old Photographs. Amberley Publishing. ISBN 9781445627649. Retrieved 5 October 2014. ↑ "Used Car test: Bentley Continental". Autocar. 130 (3824): 47–48. 29 May 1969. 1 2 Cremer, Andreas (24 June 2010). "Volkswagen Said to Shuffle Porsche, Bentley Managers". BusinessWeek. Retrieved 25 June 2010. ↑ Gillies, Mark (10 May 2010). "Going Back in Time at the Bentley Factory". Car and Driver blog. Retrieved 25 June 2010. ↑ Edmondson, Gail (6 December 2004). "VW Steals A Lead In Luxury". BusinessWeek. Retrieved 25 June 2010. ↑ Garlick. "Bentley reports record profit". Retrieved 18 March 2008. ↑ Reiter, Chris; Ramsey, Mike (15 December 2009). "Daimler Maybach Fails to Dent Rolls, Bentley Super-Luxury Lead". Bloomberg. ↑ Cremer, Andreas (14 January 2010). "Volkswagen's Bentley Targets U.S. Growth With Mulsanne Sedan". BusinessWeek. Retrieved 25 June 2010. ↑ Massey, Ray (23 January 2009). "Bentley announces seven-week production shutdown while Jaguar chief calls for Government aid". Daily Mail. London. ↑ "Volkswagen AG 2010 Annual Report". Annualreport2010.volkswagenag.com. Retrieved 24 March 2012. ↑ Cooke, Rhiannon (24 October 2010). "Bentley protests continue in Crewe over changes to working hours". Crewe Chronicle. ↑ Rauwald, Christopher (4 January 2012). "Bentley Mulls Its Own SV". The Wall Street Journal. p. B3. 1 2 "Volkswagen AG 2012 Annual Report". Annualreport2012.volkswagenag.com. Retrieved 15 March 2013. ↑ Ramsey, Jonathon (2009). "First Bentley Zagato GTZ available at $1.7M". autoblog.com. Retrieved 2 October 2010. ↑ Burt, Matt (25 May 2014). "New Bentley Continental GT3 claims inaugural victory at Silverstone". Autocar. Haymarket Group. Retrieved 26 May 2014. Parissien, Steven (2013). The Life of the Automobile - A New History of the Motor Car (Hardback). London: Atlantic Books. ISBN 978-1-8488-7705-4.